I ended the year on a very good note. However, it doesn't exactly mean that I didn't spend any money. This month, a lot of funds were diverted to spending on items we needed for the house and to finish getting it ready for visitors during various holidays. 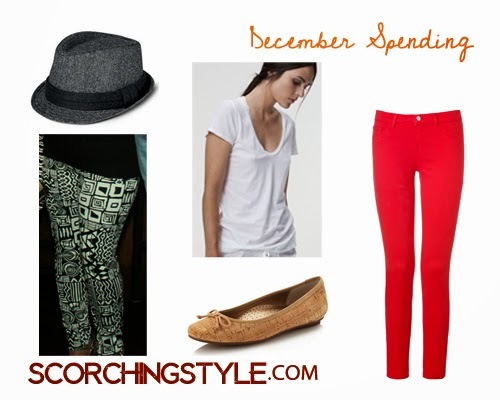 In addition, I was able to make some really great additions to my closet during the winter sales before the holidays and then we went out of town after Christmas so I was stopped from going crazy at the after-Christmas sales. I was also able to cross of The Gentleman's Hat and the White Tee replacement off my Targeted Purchase List. My Grand Total for 2014 Spending was $1,714.50. This averages out to about $145 per month, but if I am honest, I think I spend alot more than that in reality. This year I did much more bargain hunting than I would have in years before and I looked for ways to get store credits and gift cards. For example, for my birthday, my in-laws generously gave me $250 to Nordstrom which I metered and spent exclusively at Nordstrom Rack to stretch it as much as possible. I also spent nearly $1000 last December on a YSL bag, Manolo Blahnik shoes, and jewelry that I used this year because I knew I was starting to track my spending and I didn't want to start with a $350 clutch or $300 shoes (on sale!) already on the books, and that feels dishonest. In the past, I've always justified my spending as a need for a particular item and while this project really made me aware of when I was doing it, some of the victories (cork flats under $30!) seem hollow when I realize that nobody actually needs cork flats. I just really wanted them and searched high and low for something that wouldn't make my husband nuts. It doesn't matter if he ends up gifting me something because I don't want to add it to my spending spreadsheet. At the end of the day, we still spent that money. Does that make sense? How did you do this year? What will you change for next year?